I used to hate salad. Salads were usually boring, covered in ranch or some disgusting gloopy vinegar, so I stayed away. Or worse, the school salad bar which included canned peaches and cottage cheese… I couldn’t even think about salad until France. When I went to Paris the first time, I was seventeen, and my mom and I stopped at this old style Italian restaurant on the Rue de Rivoli complete with mirrored walls, red velvet curtains, and a little Italian waiter with a bow tie. It clearly hadn’t changed in fifty years. To my dismay, my mom ordered a salad for us to share. Little did I know that that very salad would change what salad meant to me. It was a lofty pile of mesclun greens with nothing but olive oil, aged balsamic vinegar, shaved parmesan, and fresh ground black pepper. Now THAT was a salad. I could eat that! That’s how salad should be! Fresh, dressed moments before eating, with good vinegar, spicy greens, and black pepper. 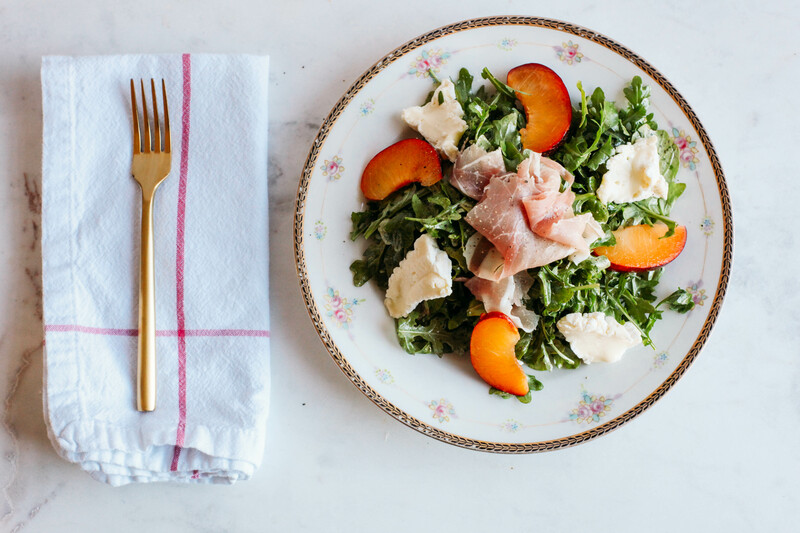 This salad has all of the above plus creamy camembert, ripe plums, and salty prosciutto. Sam hated salad, too, with the same connotations that I had before the French salad. But he changed his mind when I started serving arugula with homemade vinaigrette and a hint of mustard. Now we eat that almost every night. Making your own dressing is any easy way to give salad a new life. I put dressing in tiny ball jars and bring them to work. This salad is inspired by a recent read of mine. I read Delancey by Molly Wizenberg about a pizza shop she and her husband started. She fills it with some recipes, and one that I particularly like is the stone fruit salad. This is my take on a stone fruit salad. 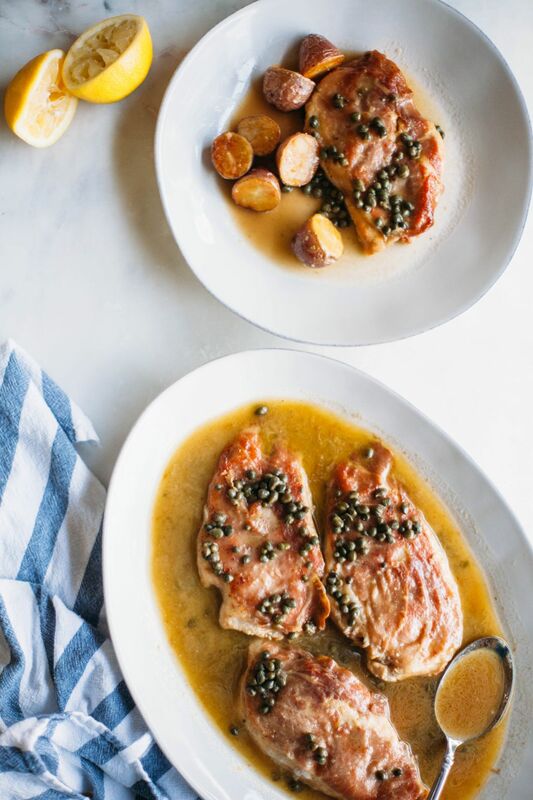 It should only take a few minutes to put together, and it would be a great desk lunch with a crusty baguette. Years ago I discovered Golden Balsamic vinegar. It has a lighter, fruitier flavor to it, so I chose it to pair with this salad, though you can use regular balsamic. 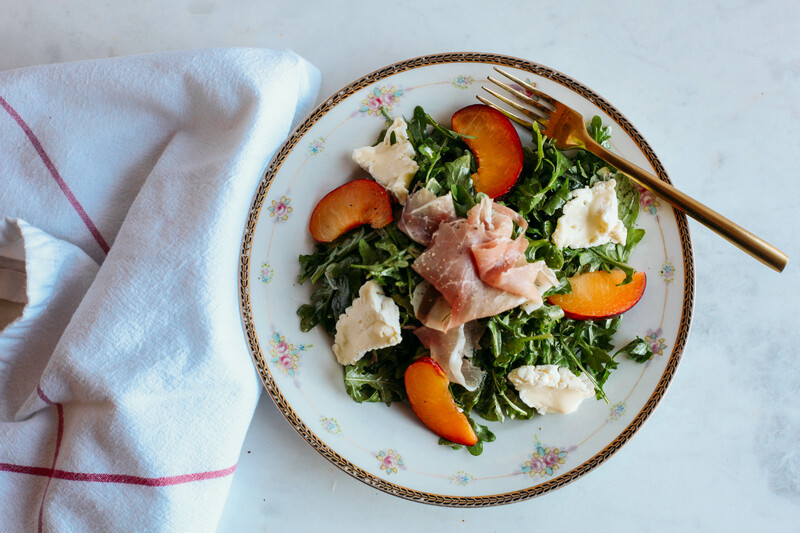 I also like the arugula here because it’s a really spicy green that complements the sweet and salty flavors of the prosciutto and plums. You can substitute a mesclun or anotherblend of greens if you like. 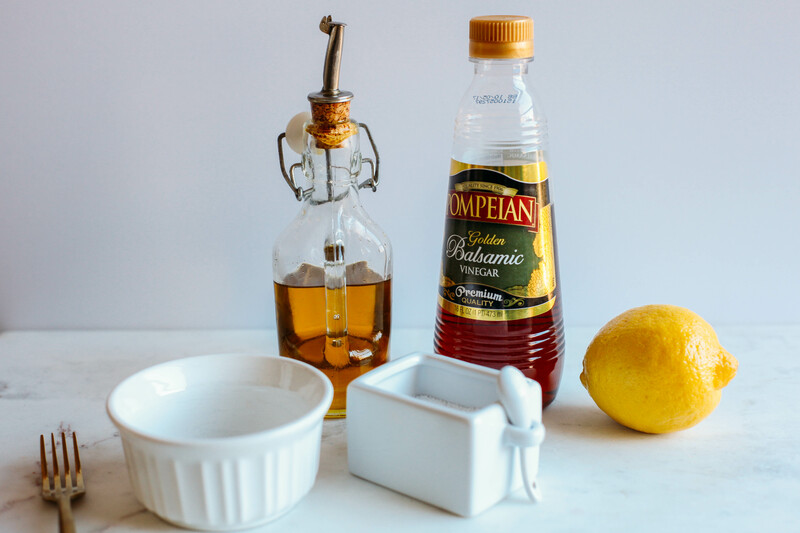 In a small bowl or ramekin, add the lemon, vinegar, olive oil, salt and pepper. Use a fork to whisk together. In a large salad bowl, add the greens. Pour the dressing over the greens, tossing to coat. Coat only just beforeserving. Pile the salad onto each plate. 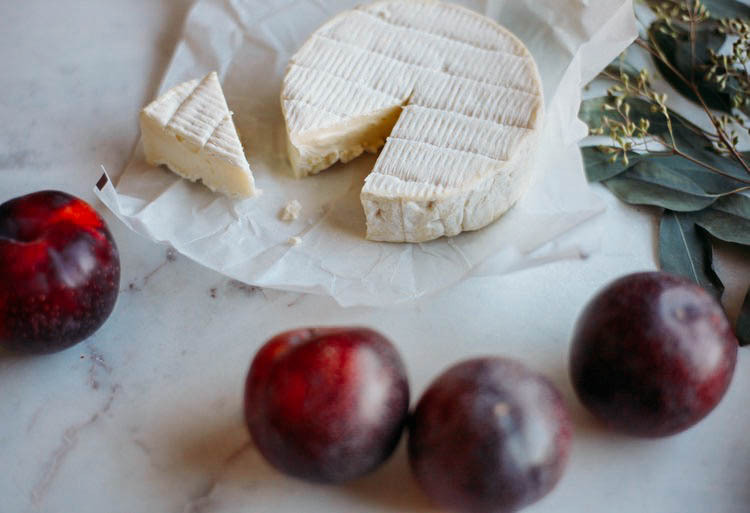 Add 4 slices of plums, 4 slices of camembert, and add a pile of torn prosciutto to the top. Add a couple grinds of black pepper. Serve immediately. If you know me, you know how much I love pizza. And basically everything else that’s very bad for you. So putting a salad atop my pizza makes me feel healthy even if it is only covering up a giant piece of bread with cheese. I had a housewarming party not too long ago, and I made the focaccia recipe from Cup of Jo’s post, featuring Katie Quinn Davies. It was a huge hit! A friend of mine suggested making it into a pizza dough. As someone who is constantly trying to turn things into pizza, I was like, Why didn’t I think of that? It turned out great! The crust is fluffy and thick (still very focaccia-y). And the pancetta gets crispy like bacon. Using fresh mozzarella is absolutely worth it. It melts and bubbles perfectly unlike the shredded kind. 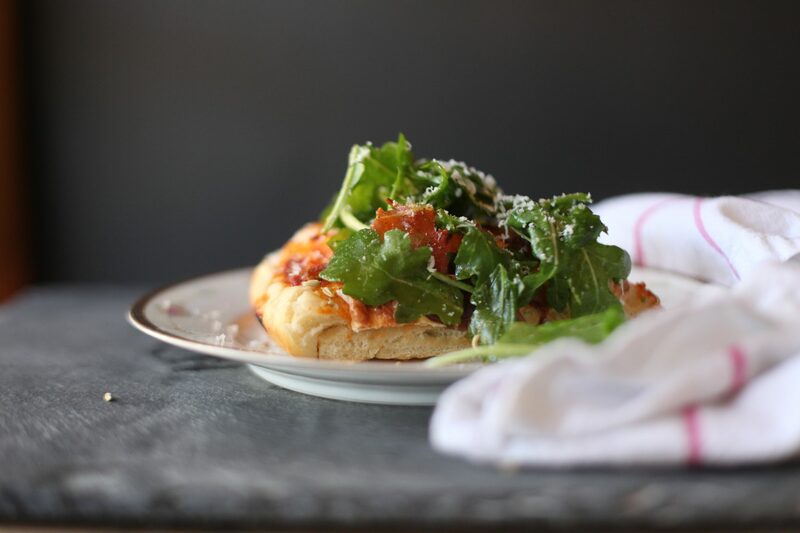 And the dressed arugula has a tangy herby twist. I actually use that vinaigrette on everything. We eat arugula salads constantly, but that mustard vinaigrette could go great on any greens or as a chicken marinade. I digress. This is my interpretation of Focaccia turned pizza turned salad. In a small bowl, mix together 11 ounces of warm water, yeast, 2 1/2 tbsp olive oil and sugar. Let sit for five minutes, until frothy. Sift flour into a large mixing bowl. Make a well in the center and pour in the yeast mixture, mixing together with a fork. It will appear crumbly but moist. Form into a ball and knead on a floured surface for ten minutes until elastic and smooth. Form into a ball and place in a large greased bowl. Cover with a damp towel and let sit for one hour in a warm place until doubled in size. 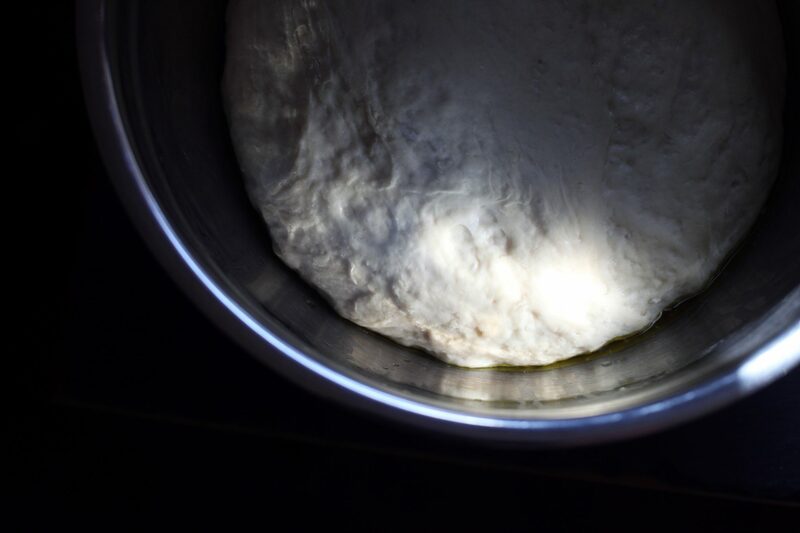 Once dough is doubled, punch it down in the bowl and then remove to a floured surface. Knead 1-2 minutes, adding in the fennel and a pinch of sea salt into the dough as you knead. 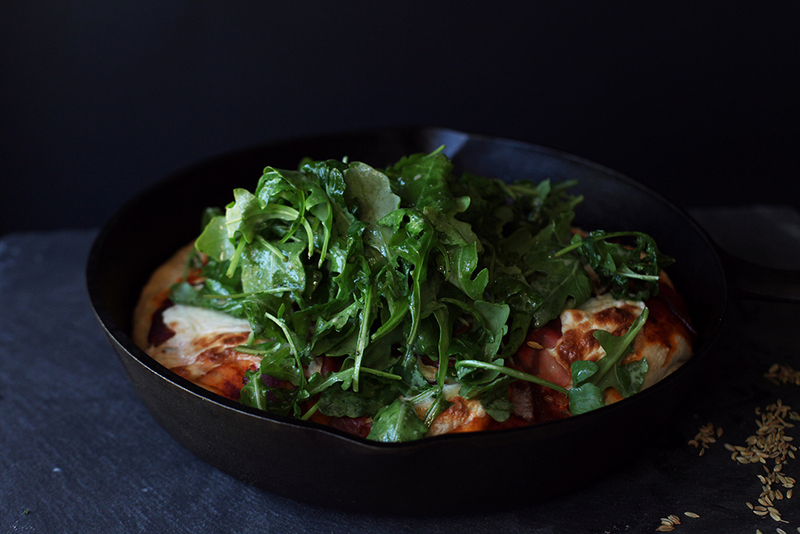 Halve the dough if you are using a cast iron skillet, or if you choose, use a large baking sheet for one big pizza. Preheat the oven to 425 degrees F. Grease two cast iron skillets (or one baking sheet) and flatten and shape the dough to fit the bottom of the pan. Sprinkle with additional sea salt and fennel. Cover with a damp towel and let rest for 20 more minutes. Add a few spoonfuls of marinara and spread to coat the dough evenly. Place the mozzarella on top. Spread onions evenly then add the prosciutto. Bake for 20 minutes until cheese is a little browned an bubbly. Let cool for a couple minutes. Meanwhile, mix together the olive oil, mustard, and red wine vinegar. Season with salt and pepper. 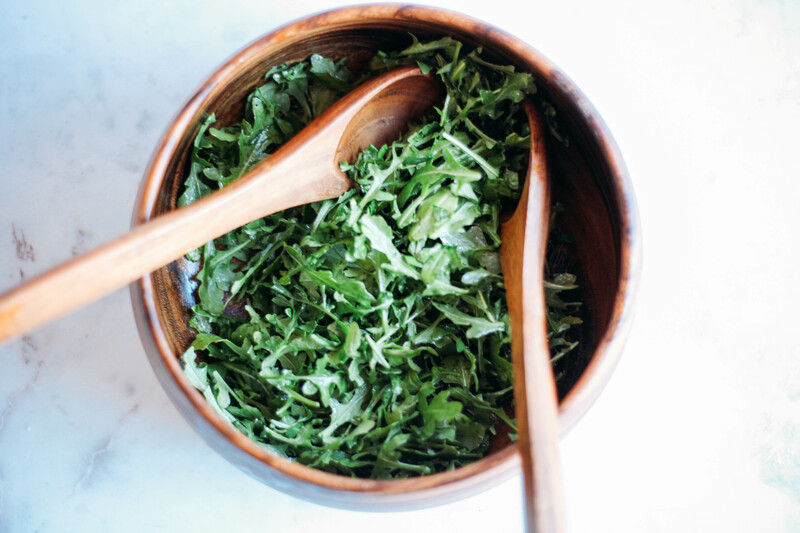 Toss the arugula with the vinaigrette in a large bowl until evenly coated. Add to the top of the pizza before cutting and serving.